The first European standard for gloves protecting against chemicals was published in 1994 as EN 374-1, and was subsequently revised in 2003. Now 13 years later the second revision has just been published as a joint International and European standard with the reference EN ISO 374-1: 2016. There are various changes between the 2003 version of EN 374-1, and the latest EN ISO 374-1 standard. The 2003 version of the standard included a penetration test (to check that there are no holes in the glove) and a permeation test (to determine the time for a chemical to break through the glove material). These tests remain in the 2016 version although the test procedure for measuring permeation has been revised. However, a new degradation test has now been added to the standard. This measures the change in physical properties of the glove after being exposed to a chemical for a period of time. However, the obligation to test chemical protective gloves for mechanical properties in accordance with EN 388 has been removed. This is now optional for gloves manufacturers who wish to claim both chemical and mechanical protection in their product. Type A gloves have to achieve a defined level of permeation resistance against at least six of the 18 chemicals listed in EN ISO 374-1. The six tested chemicals shall be identified by their code letters under the flask pictogram which must be marked on the glove or its packaging. Type B gloves have to achieve the same defined level of permeation resistance against at least three of the 18 chemicals listed in EN ISO 374-1. Again with the tested chemicals being identified by their code letter under the flask pictogram. Type C gloves have to achieve a lower defined level of permeation resistance against at least one of the 18 chemicals listed in EN ISO 374-1. SATRA is one of Europe’s foremost Notified Bodies for certification of Personal Protective equipment and have been testing gloves that provide protection against chemicals for over 20 years. 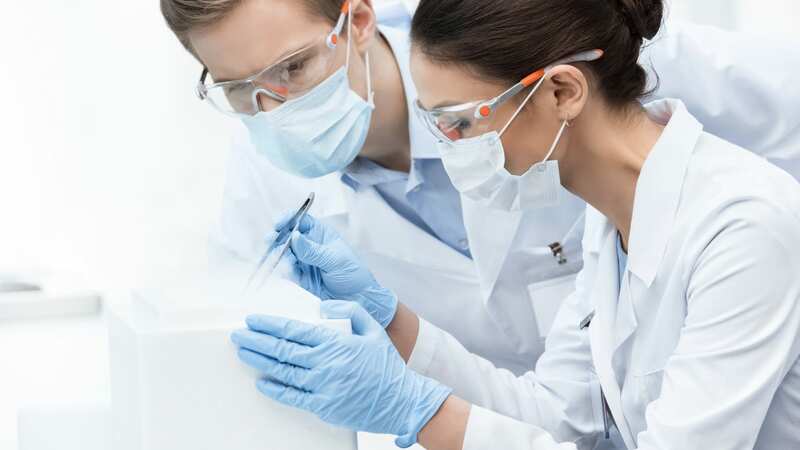 We have a dedicated team of assessors to guide you through the certification process, as well as fully equipped physical and chemical laboratories. SATRA’s chemical laboratory has an extensive range of detection techniques for permeation testing, which can be used to test for many more than the 18 challenge chemicals listed in EN ISO 374-1. We are also able to measure permeation resistance against a range of cytotoxic drugs. For more information please contact chemistry@satra.com.